It has been a wild ride in Toronto this past week at Rogers Cup presented by National Bank. With the entire Top 10 in attendance, young talent mixed into the draw, a ton of off-court entertainment and many, many funny moments throughout the week, we reflect on some of the best moments at this year’s tournament. It was a summer of firsts at Rogers Cup. Along with a first-time champion winning the title in Toronto, the tournament saw a handful of top players win their first match ever in Toronto: Venus Williams, Garbiñe Muguruza and Caroline Wozniacki. Williams is the 2014 Coupe Rogers runner-up and Wozniacki won the title in Montreal in 2010. Prior to this season neither of them had ever seen victory in Toronto. Muguruza, as well, got her first victory in the city and enjoyed a career-best run to the quarterfinals. There were two points that had everyone buzzing throughout the week, and they came within the first two days of the tournament. The first was hit by Russia’s Daria Kasatkina in the first match on Grandstand Court on Monday. Tweeners are not a very common shot on the WTA Tour but the way Kasatkina hit this passed Vinci, who has outstanding net coverage and volley skills, was miraculous. Hot shots may have belonged to the next generation of WTA talent at Rogers Cup this summer. A day after Kasatkina’s tweener, Bianca Andreescu took to Centre Court for her Rogers Cup debut and showed off some insane footwork against Timea Babos. The only other player capable of covering this much distance this quickly would be Caroline Wozniacki. 17-year-old Andreescu made it look easy, too! 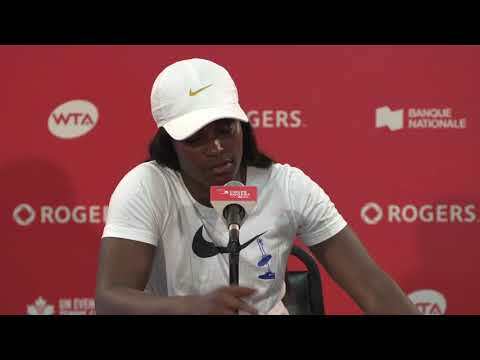 While Denis Shapovalov was coming back from a set down to defeat top seed Rafael Nadal at Coupe Rogers, Canadians Bianca Andreescu and Carson Branstine were live tweeting their time watching the match from Toronto. ICYMI Denis Shapovalov went on a tear through the draw in Montreal at Coupe Rogers this week. The 18-year-old from Richmond Hill defeated Juan Martin del Potro, Rafael Nadal and Adrian Mannarino en route to his first Masters 1000 semifinal. An entire country rallied behind Shapovalov, including his fellow Canadian Next Gen players Andreescu and Branstine. Andreescu and Branstine took over the Rogers Cup Twitter account during Shapovalov’s match on Wednesday night and interacted with fans around the Rogers Cup site as well as on social media while watching Shapovalov win his third round match over Nadal. The duo didn’t do so shabby themselves in Rogers Cup, either. They entered the doubles draw as a wildcard team and defeated Kristina Mladenovic/Anastasia Pavlyuchenkova in the first round. What happens when the best players in the world compete against each other OFF the tennis court? We got some of the top players in the world to play a round of Heads Up with comedian Trevor Boris and it turned out exactly how you might’ve expected – hilarious! 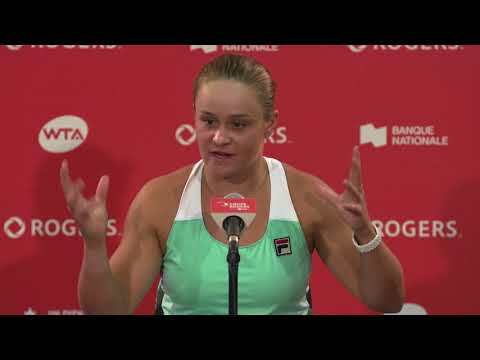 From dancing to the splits and even a few John McEnroe impersonations, Karolina Pliskova, Simona Halep, Angelique Kerber, Garbiñe Muguruza, Elina Svitolina, Caroline Wozniacki, Johanna Konta, Svetlana Kuznetsova, and Bianca Andreescu played a special edition of ‘Heads Up at Rogers Cup’ during All Access Hour. Andreescu and Muguruza tied for first place with nine correct answers while Svitolina finished in last place with a score of three. In October 2013 Sloane Stephens achieved a career-high ranking of no. 11 in the world. She won her first title at the Citi Open in 2015. In 2016 she was three titles in the first four months of the season. After the Rio Olympics last summer, Stephens cut her season short due to injury and soon after underwent foot surgery on her left foot. She did not play from July 2016 to July 2017. Stephens, now ranked no. 934, entered Rogers Cup with a protected ranking of no. 26. In her third tournament of the season, Stephens picked up her first win back from injury in Toronto with a comeback win over Yulia Putintseva: 6-7(4), 6-0, 6-4 in two hours, 12 minutes. The run didn’t stop there for the resurgent American – Stephens made a run all the way to the semifinals before falling to Caroline Wozniacki. En route to the semis, Stephens defeated Putintseva, no. 14 seed Petra Kvitova, no. 3 seed Kerber, and former Roland Garros runner-up Lucie Safarova. Did you attend any of the night sessions at Rogers Cup presented by National Bank this year? Then you would have been treated to exciting performances by Volta inspired by Cirque du Soleil. From dancing on ladders to rolling around in giant rings, these entertainers brought more thrills and chills to Centre Court this summer. 2017 may become known as the year of Elina Svitolina! This 22-year-old sensation from Ukraine captured her fifth title of the season in Toronto. She also claimed the title in Dubai, Taipei City, Istanbul and Rome. Rogers Cup is her third Premier 5 title this season and ninth career title. She is a perfect 5/5 in finals this year and holds a 9-2 record overall. Svitolina’s road to her first Rogers Cup title was not easy. The world no. 5 had to get by a fellow youngster in Daria Kasatkina in the second round. From there she faced Venus Williams, Garbiñe Muguruza, Simona Halep and Caroline Wozniacki. Svitolina only dropped one set en route to the title – the first set in her quarterfinal match against Muguruza. Thank you for joining us for another terrific year at Rogers Cup presented by National Bank. We can’t wait to see everyone back next year for the men’s tournament in Toronto from August 4-12, 2018.